This was our third day in Shanghai port. We weren't scheduled to sail until 1:30 pm, so we had time for one more short tour. They offered a ride on the MagLev train this morning so we signed up. For anyone who doesn't know, MagLev stands for magnetic levitation. 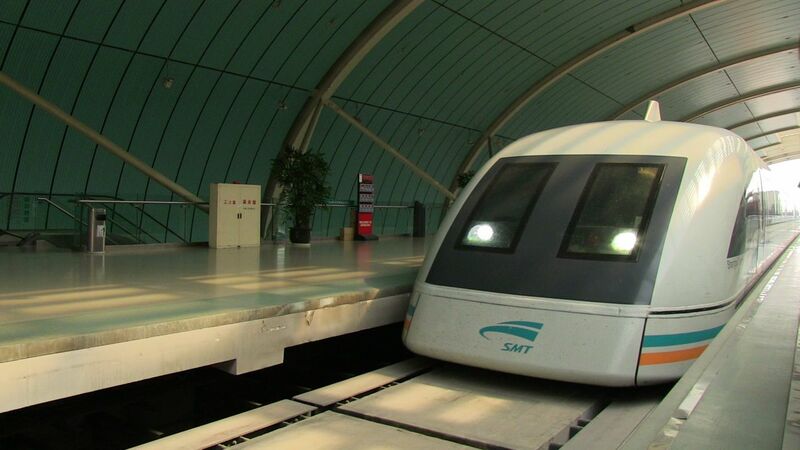 There are only 3 trains of this type in the world, one in Germany, one in Japan, and this one in Shanghai, China. It was about a 45 minute ride from the ship to Longyang Road station. 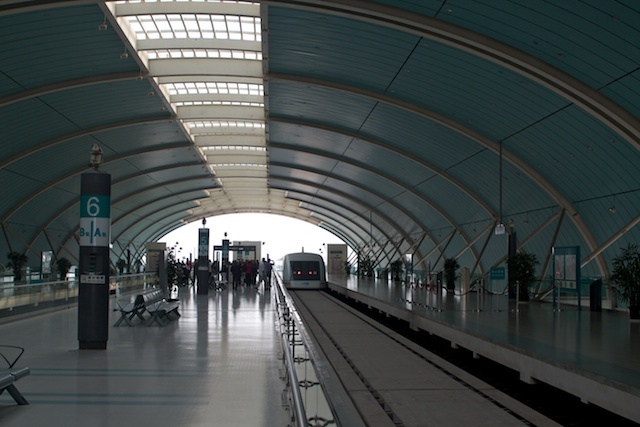 The train only travels a short line, between this station and the Shanghai Pudong Airport. It is an 8 minute ride each way to cover the 30.5 km (18.95 m) run and reaches a top speed of 431 km/hr (268 mph). There are 2 tracks, with a train running every 15 minutes each way. When the train on the other track passed us, several people tried to take a photo, but it went so fast there was no chance. The train left the station at 10:15 and it took us about 3 minutes to reach to maximum speed and another 3 minutes to decelerate. 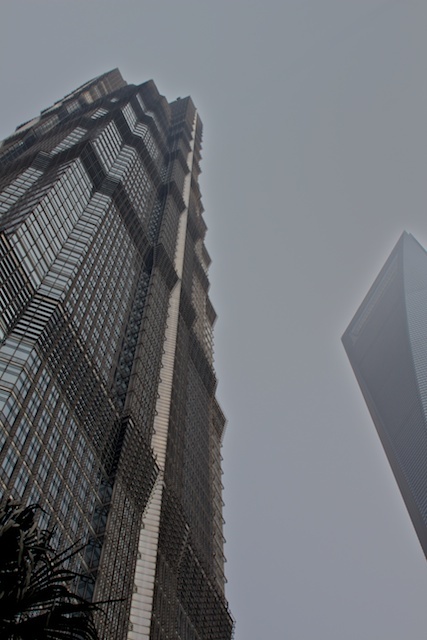 After this round-trip thrill ride, we got back on the bus for a trip to the Jin Mao Building again. We visited this tower on our first day in Shanghai, but it was included in today's tour as a ride on the fastest train combined with a ride on the fastest elevator. I don't think I mentioned the other day that it takes 45 seconds to travel to the observation deck on the 88th floor. We came to the tower from a different direction this time so we got to see a different part of the city. 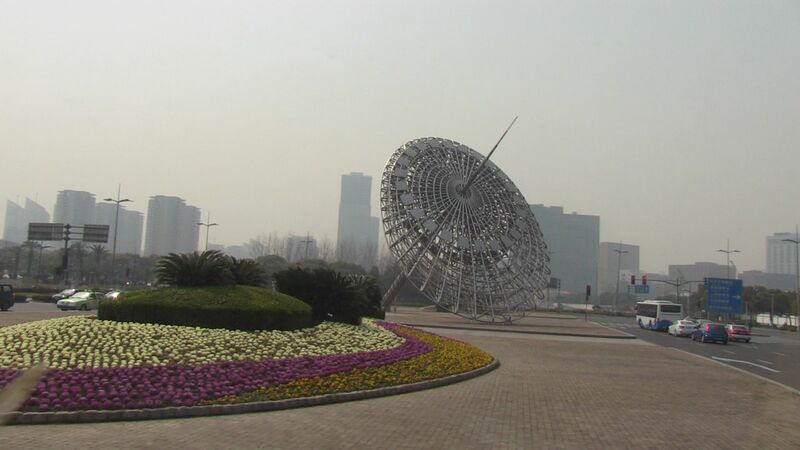 I liked this sundial sculpture that is located in the center of a roundabout. We hesitated about going up in the tower again because it was another foggy day, but finally decided it was better than sitting in the bus for 45 minutes waiting for the rest of the group. We had a nicer day yesterday, but of course, no tours left the ground that day. Our ship left the pier on time this afternoon, but we did an unusual maneuver getting out. The captain actually backed the ship down the Huanpu River for the first mile before turning the ship around. I guess there wasn't enough room for him to turn the ship around until we got that far down river. We had 2 tug boats following us down the river until we got to the wider Yangtze river. I understand that it will take until about 8pm to get to the mouth of the Yangtze and back into the East China Sea. Tomorrow we have a day of rest - a day at sea. We are both tired out from the past few days so we are ordering dinner in the room tonight. We'd like to go to the show, but I'm not sure we're going to make it. After dinner and a bottle of wine we are probably just going to fall soundly to sleep.